I was supposed to meet with a friend yesterday before she left for Paris, but she fell ill and I was left with an open evening after a day-long conference for work. I hadn’t posted in a while so I figured a decent restaurant-outing would be good, plus I hadn’t eaten anything except company logo cookies all day. Got off at the W4th stop in the West Village (near Washington Square Park and NYU, though NYU’s pretty scattered now that I think about it) and walked around until I stumbled on Cornelia Street, between Bleecker and W4, a tiny land quiet little street that’s got three Zagat Surveyed restaurants (including Pearl) and others crammed next to one another. 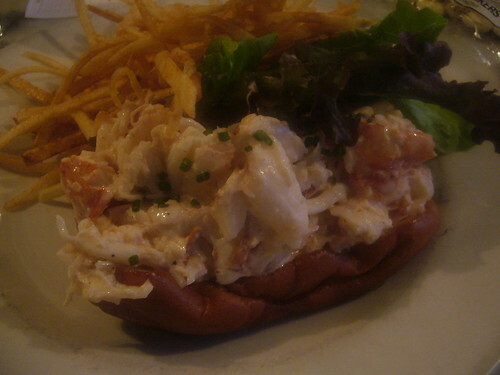 Those who read Adam Roberts‘ blog may remember the time he cooked his friend’s “pet” lobster, Emma?, and turned it into a lobster roll, modeled after Rebecca Charles‘ invention for the Pearl Oyster Bar, the first in Manhattan and to me, the most delicious. I didn’t order anything else except this dish, which was listed as under market price on the menu (and turned out to be pretty damn pricy)…tricky tricky. I sat at the bar so I got to watch other people munch on their fried oysters and grilled chicken caesars, but when my order came out, I forgot everything else. The actual sandwich was smaller than I thought it would be, with the bun was lightly toasted and slathered with copious amounts of the butter that nonetheless tasted delicious. It was so stuffed with lobster that I had to eat most of it with a fork, but I loved that wonderful tang from the lemon juice and the hints of celery. Plus, there weren’t any giant gobs of mayonnaise to be found and that’s usually my pet peeve when it comes to mayo-based salads and sandwiches. The lobster, which can be easily overcooked if one doesn’t pay attention, was succulent and firm (I like a little bite in my crustaceans) and I had to stop myself from wolfing it down the minute the waiter laid the plate down in front of me. Shoestring fries were cast aside since they weren’t anything special. Like I said, I only went to try their famous lobster roll, but their clam chowder and fried oysters are highly regarded as well. Though in the end, I think it’s still a better idea to splurge a little on the sandwich than skimp. After all, this was the first of it’s kind in Manhattan, and it’s always good to experience an original. « Father’s Day & Mom’s Birthday brunch at 1-9. You are currently reading Pearl Oyster Bar at Notes on Food.